The Foundation Day Blessing Ceremony represents the culmination and offering of True Father’s entire life course, and the completion stage of True Parents’ Holy Blessed-marriage union in the image and likeness of our Heavenly Parent. Therefore, it is God’s own substantial wedding ceremony. It is also the ceremony through which True Parents want to renew all Blessed members and families as the direct descendants of the original lineage. It is a ceremony for all Blessed members and families, and all participants should take part in the Foundation Day Holy Wine Ceremony prior to Foundation Day. 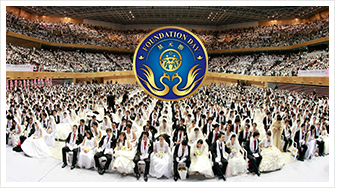 Blessed Unification Church couples of all generations and their families, including those who participated in the Cosmic Blessing Ceremony on February 17, 2013. Ambassadors for Peace, clergy and others who have received the Blessing Ceremony as a previously-married couple and have completed the indemnity-stick ceremony, 40-day separation period and three-day ceremony. Blessed couples and families are invited by True Mother to participate in the main ceremony in Korea on Friday, February 22nd (Korea time). Those who cannot participate in Korea should join an official ceremony organized in each District on Thursday evening, February 21, 2013 with a simultaneous Internet webcast of the main ceremony. Local pastors should be contacted for the local schedule. Study all of the information in this website and complete the registration form online. True Parents are inviting all Blessed members to participate and receive total grace and renewal based upon Father’s life and foundation. This is a comprehensive, total grace for all mistakes, failures and sins of omission and commission. Participation should include the intention to live in accordance with True Parents’ teaching in the future. There should not be any judgment or rejection of any person based on their past mistakes, whether they participate in the Foundation Day Blessing Ceremony or not. Prior to the Foundation Day Blessing Ceremony on February 22, 2013, which is a renewal ceremony for all Blessed families, True Parents will officiate a Cosmic Blessing Ceremony for couples being Blessed to each other for the first time. This ceremony will take place at the Cheongshim Peace World Center at Cheong Pyeong, Korea on Sunday, February 17, 2013 and simultaneously via Internet in the United States (Saturday evening, February 16th USA time). There will be a National Cosmic Blessing Ceremony in New Jersey, near New York City, and ceremonies held in each district. Candidates matched during the February 12-14 Cheon Il Guk Standard Matching program. Couples can join the National Ceremony in Cedar Grove, NJ, 30 minutes from New York City, with education, entertainment, a lovely dinner and celebration on Saturday evening, February 16, 2013 (USA time). Registration is at http://fs6.formsite.com/hsauwc/feb16_usa_cosmicblessing/. Couples can participate in a district-sponsored ceremony February 16 (USA time) near where they live. District offices should be contacted for the time and location of their local ceremonies. There are two important processes to complete. One is the process of qualification for the Blessing itself. The other is the process of registering for the Blessing Ceremony event. Both can be achieved through instruction at http://foundationday.unification.org/cosmic-blessing-ceremony/. What is the dress code for the Cosmic Blessing Ceremony? The dress code for women is a white or light-colored dress and light-colored shoes. A wedding gown can also be worn. The dress code for men is a dark-colored suit, dark shoes and red tie. How can I attend the National USA Blessing Ceremony in the New York City area?